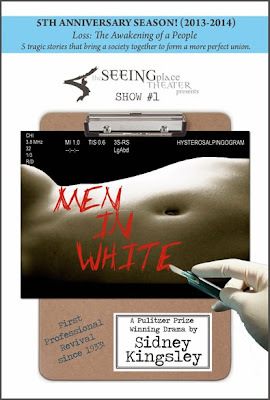 The Seeing Place Theater is staging a revival Men in White. It is playwright Sidney Kingsley's first major work and he won a Pulitzer for it in 1934. About a medical resident, it is ahead of its time in focusing on abortion and medical procedure. I found it to a be a particularly timely subject and surprisingly relevant given the volatility on the subject that has lately been plaguing my home state of Texas. No doubt, the play was ahead of its time. Leading the large ensemble cast, Brandon Walker plays Dr. George Ferguson, the young resident torn between his passion for medical advancement and living a more care-free life. As the play went on, I saw Brandon become more and more the weary young resident doctor we see on tv shows - a very impressive and palpable performance. The cast was one of the largest I've seen in off-off Broadway and did a good job. It felt improvised - at time very natural and off the cuff, mixed with awkward pauses. Although the pacing was a bit slow, my attention was captured and I kept thinking about the timeliness of the subject. Seeing Place Theater focuses on the actor-driven ensemble. They are committed to the development of actors, directors, writers, and designers. They perform at ATA's Sergeant Theatre on West 54th, just off 8th Avenue and tickets are just $12. This revival of Men in White is an excellent opportunity to see a rarely performed masterpiece that is often thought of as the model for medical dramas. It runs until November 24th. Tickets are available via SmartTix.